Gents, I believe I picked up the wrong drop tanks for my P-51 build. I believe I have the 300 gallon tanks and I actually need the 150 gallon tanks. I'm under the impression these are available in the ZM Skyraider kit, I believe I have also seen the min the Kitty Hawk Bronco kit and possibly other Vietnam era kits? If any has a spare set of aero 150 gallon tanks they dont want please let me know me know. Willing to buy! Tony, the Trumpeter sky raiders had centerline tanks that were smaller and skinnier, do you think these might work? I can swap you out if they are the right ones. These are 250 Gal. There is a pic below of the 150 with measurements, you can do some scale conversion and measure. No unfortunately not Mark. The ones I need are the "mini me" versions of the bigger ones apparently. I had no clue there were different sized ones of the same design....learn something everyday. Bump and correction made. Looking specifically for Aero 150 gallon tanks from any kit. Do you think the OV-10 A kits have them? If so, you can have those from my kit. I am asking, not because I am too lazy to check the box( ), but because in fairness I would not know what to look for. I confess I am no « hanging things » specialist. Hubert to be honest in not sure. It looks like the centerline fuel tank may be correct but I'm not sure what size it is. Do the instructions indicate what amount of fuel it held? I'll have a look, especially now that the dimensions have been posted. The OV-10A box has one centerline tank, described as a "230 L tank" (that is roughly 61 gallons). The kit tank is 134 mm long and 16 mm dia. 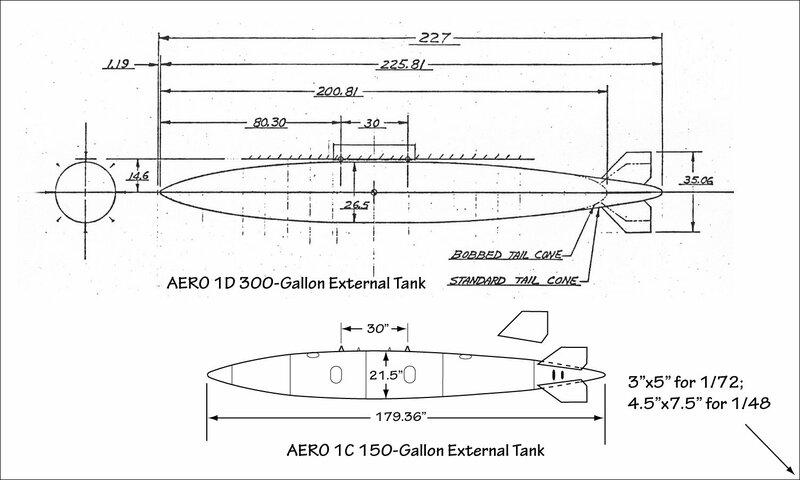 According to the drawing published above by 1to1scale, the tank should be 142 x 17 mm. The kit's tank is close, but not quite what you are looking for, and there is only one. It could be adapted though, although I would suggest that turning a wood dowel chucked in your electric drill might produce just as quick a (double) result. Let me know , and PM your address if you want it. Thanks Hubert. I'll keep looking for now. Fisher patterns made a 400G and 300G but i think they may have also had a smaller tank in some kits? All the A-4 kits seem to have the 300 gallon tanks. I believe the short end cap there was for the centerline tank but still for the bigger tanks. I'll swing back and double check reviews of A-4s just in case. 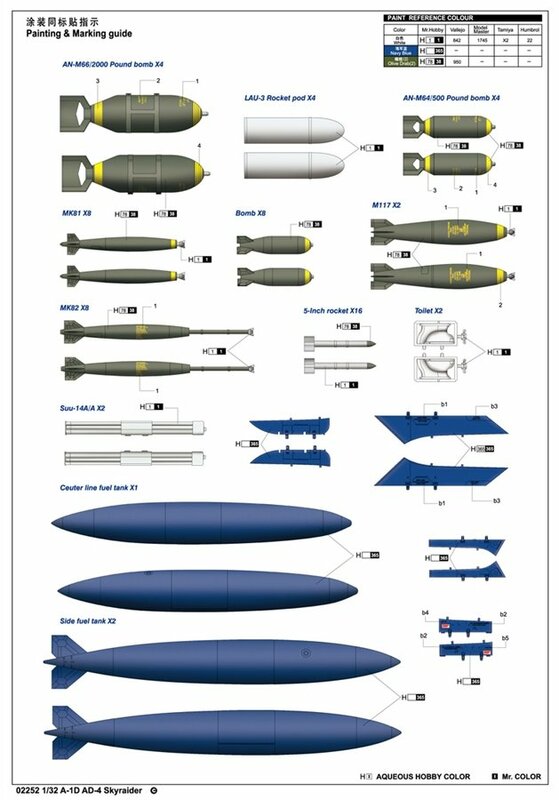 Does Harold at AMS Resin list any? Not that I saw. I thought he was going to have some but I dont see them. I wrote this the other day!!! But it did not post? I new someone made them LOL But he does not have them on his site. Contact him direct? Do you still have 1/32 150Gal Aero /Douglas drop tanks? Harold to the rescue!!! Thank you so much everyone for helping me solve this problem.